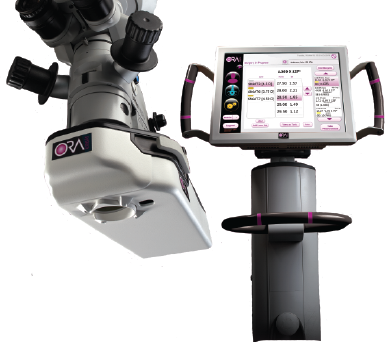 ORA System™ is a big advancement in eye lens surgery, allowing us to make the best choices during surgery as to what will benefit your eyesight the most. The ORA System™ is especially helpful in astigmatic patients. Because ORA uses Wavefront technology to analyze imperfections in the eye and what is causing a refractive error, your surgeon knows exactly what needs to be corrected. Also, ORA can tell during surgery whether or not the eye is focused, and if it is not, the ORA system helps us focus the eye. If you are considering clear lens exchange surgery or cataract surgery, ask us about the ORA system!